Service dog identification is important as it helps to distinguish your working dog from a regular pet while in public. By providing a service dog id, such as a vest, tag or card, it makes it easier for business owners and the general public to understand that your canine or other type of animal is doing its job by accompanying you. Contrary to popular belief, service dogs come in many shapes and sizes. While it's still common for Labrador retrievers to be service dogs, dogs as small as a Chihuahua can also serve a purpose as a service dog. However, there are some people that may not be aware of this, and may question you regarding your small service dog. Outfitting your dog with a service dog identification vest, or simply carrying around a service dog ID card can help to address any issues before they begin. What are the ADA Rules for Service Dogs? 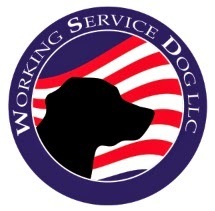 According to the American with Disabilities Act (ADA), privately owned businesses must allow service dogs to accompany people with disabilities into their establishments. This holds true for restaurants and other businesses that may not typically allow pets. Under the act, businesses can't ask about the disability or require any paperwork but they can question if the dog is required to help with a general disability. They can also ask what tasks the dog has been trained to assist with. Wearing a service dog ID will make it evident to the public that your dog is a service dog and will probably lessen the number of questions about its purpose. Of note, Emotional support animals, comfort animals, and therapy dogs are not service animals under Title II and Title III of the ADA. Other species of animals, whether wild or domestic, trained or untrained, are not considered service animals either (source). However, ESAs can benefit from wearing a service vest, or by the handler carrying an ID stating that the animal is indeed an ESA. What Happens When There's a Problem? Although service dog identification won't solve the problem in every case, it can help to reduce the amount of resistance from the public.